The Vice President, Prof. Yemi Osinbajo, yesterday reacted to the violence that rocked the All Progressives Congress (APC) campaign rally held in Ogun State where the party’s national chairman, Adams Oshiomhole, was booed and pelted with stones by an irate crowd. Osinbajo said any member of the APC working against the success of the party in the forthcoming general elections is like ”a bad cutlass with two blunt edges”. 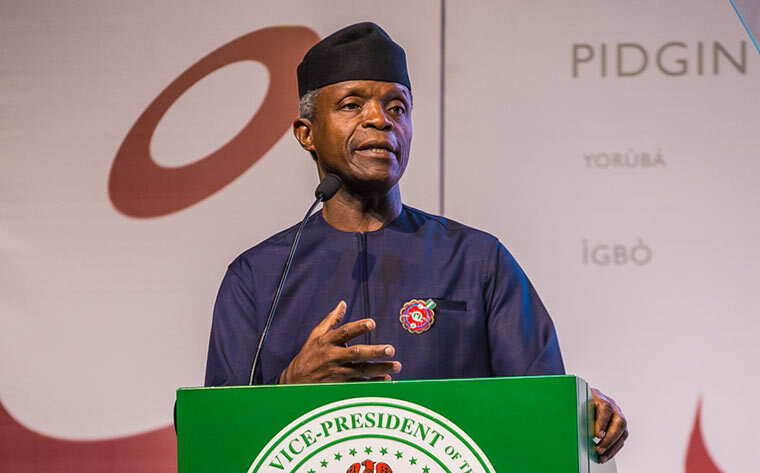 Osinbajo stated this during a town hall meeting held at the palace of the traditional ruler of Ago Iwoye, Abdulrazak Adenugba, in the course of his campaign tour of the state. Osinbajo, who was also at the violent rally, said despite the incident, the electorate should vote massively for the party and its candidates. He said the APC is the only party that has the capacity to improve the lives of the people. ”Vote for APC alone in all the elective offices because we don’t know of those who are meddling or promoting another party. Anyone caught in such an act can be described as ‘bad cutlass’. “Remember that a cutlass should have only one sharp edge. Anything short of that makes such cutlass a bad one. “Even the most hardened enemy of President Muhammadu Buhari knows that he is not a thief nor is he corrupt. And secondly, you have to vote for us because of the many things that we have in stock for you. “Those things include The Npower scheme which presently has a capacity of 500,000 which will be increased to 1.5 million when we win the coming election. Another is the Tradermoni and market money scheme which is targeted at empowering market traders. Whenever you pay back, the money given to you, another will be given to you. Another is employment for the youth which is very important among others,” he said.